A �Made in America� label implies something about labor conditions which are frequently not true. 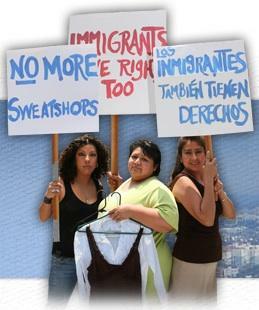 Immigrant workers Lupe, Maria, and Maura work in America�s garment industry toiling 14-hour days and for a sub-contractor who avoids minimum wage laws or providing a safe working environment. The workers accept these conditions until activists from the Garment Workers Center help them organize and legally challenge the large retailer whose clothes they sew. Compelling, with humor and drama, this documentary follows them through their struggle, depicting their doubts, their growing courage, and their empowerment. The film is directed by Almadena Carracedo.